Hello Central Give me Heaven above is in the lobby of AT&T headquarters in San Francisco. Meknes, above, Meknes, painted steel triptych photograhed in front of SF City Hall 1985. In permanent collection of Oakland Museum of California. Outdoor site on Lakeside Drive. Chimayo, left, painted steel, is in Governor's Mansion in Santa Fe, NM. Not Your Average Abalone, above, seen daily by commuters is in front of the Ferry Terminal near artist's studio in Vallejo, CA. In 1989, Benbow received the Royal Ueno Museum Purchase Award, during the 6th Annual Henry Moore Exhibition, for They Laughed at Columbus, above. 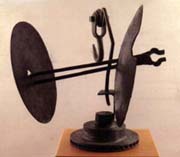 The following year East is East a steel sculpture inspired by visits to Buddhist and Shinto shrines near Kyoto, was also purchased for the permanent collection. The Pacific Design Center, Los Angeles, gave him a solo exhibition at Westweek92 which attracted 30,000 designers to see new trends in design. After the show, Warner Brothers rented all 7 pieces for the filming of the English version of Le Femme Nikita. Travels have taken him to the Chateau du Pourtales, a 70 acre sculpture park in Strasbourg, which includes his aluminum sculpture Xanadu, above, in the Schiller University collection. Painted steel piece Rainmaker won 2nd prize at the 5th Annual Festival des Arts, Beaulieu-sur-Mer, France in an international competition with 150 participating sculptors in 1994. It is permanently installed in a downtown Riviera park overlooking the Mediterranean. Rene di Rosa's Napa/di Rosa/Preserve" includes Benbow's aluminum geometric sculptures Terra Incognita and A Rockets' Red Glare in addition to his painted steel triptych, Hyperboreans. His painted steel triptych Pillars of Hercules is in the permanent collection on display at Grounds for Sculpture (Johnson Atelier) Fairgrounds Drive, Hamilton, NJ . 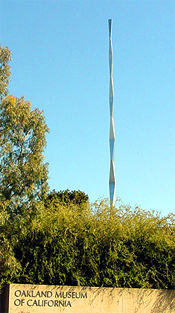 "Albedo", his 32 foot high stainless steel endless column sculpture joins their permanent collection June 2003. FACT SHEET : click for more info. Grand Opening “ Beeldenpark Drechtoevers, Zwijndrecht, Netherlands. Dedicated by Queen Beatrice, who is a sculptor. 3rd International Sculpture Symposium, Europas Parkas, Vilnius, Lithuania. Valley Sculpture Park, Farnham, Surrey, U.K.